I’ve always wanted to do today’s first, sending a message away, tucked inside a bottle. If memory serves me, and sometimes it abandons me, my children did this on our visit to the Atlantic Ocean, 25 years ago. I’m sure I helped them. I don’t think I tossed a bottle of my own into the waves though, choosing instead to make sure they had that experience. Living in land locked Missouri means I sent my message out on a local river. I have to admit, I hesitated for a good long time before I sent the bottle arcing through the air. It felt a bit too much like littering! I finally convinced myself it was for a good reason. It was very windy today and although I threw the bottle as hard as I could, it didn’t fly out very far. It is likely the bottle will be found later today, bobbing gently near the shore, a short distance from where I tossed it! There is something mystery and romantic about a message in a bottle. I googled to read stories of messages found. My favorite was of a WWI soldier who in 1914 tossed a beer bottle, containing a letter to his wife, into the English Channel. He was killed two days later in France. The bottle was dredged up by a fisherman in 1999 in the River Thames. The wife had died in 1979. The letter was delivered to the man’s 89 year old daughter. What a treasure for her. My message was simple, handwritten on a square of parchment type paper. I explained briefly that this was a first for today and asked the one who discovers the bottle to email me and let me know where the bottle was found and the date. I ended the message with a few encouraging words. It was fun to imagine where it might go, if only the bottle can reach the river’s strong current. I enjoyed thinking about who might receive the message and if a heart would be lifted by the words and lips curl into a smile. It made me think, isn’t that like life? We send out messages, with our actions, with words, and have no idea how far they go and how many people they touch, for good or for bad. What we send out eventually returns to us, bearing the same type of message we sent out. I hope my bottle is found, and an email comes back to me. And I intend to be mindful of all the messages I set adrift. 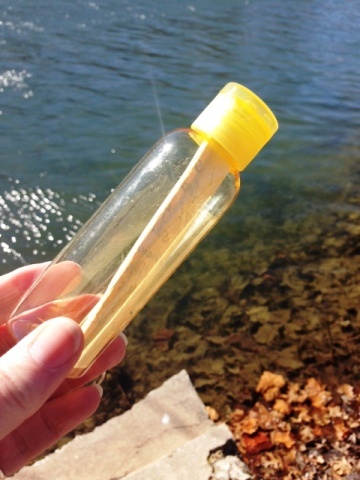 Update: I received an email from a man named Eric saying he had found my message in a bottle on April 26, near Zans Campground, which is several miles from where I tossed it into the river. Eric made my day by contributing to my first for February 17!